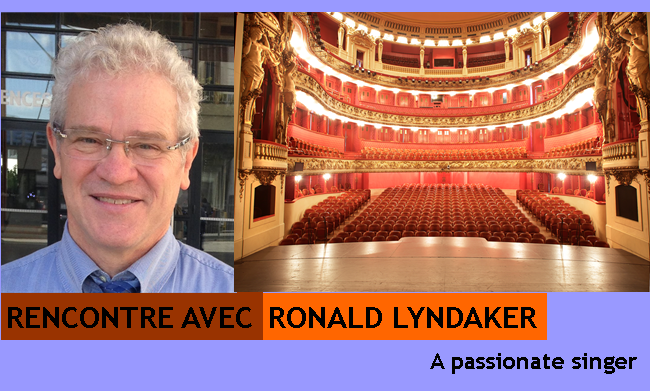 Dans les coulisses du spectacle : Interview avec Ronald Lyndaker, ténor à l’opéra national de Lorraine. Originaire des États-Unis et passionné de chant depuis son plus jeune âge, Ronald Lyndaker fait vibrer de sa voix le chœur des français. He discovered the opera and lyrical singing at university, thanks to the advice of one of his teachers. And then he began his career as a chorister. In 1985, Mr Lyndaker joined the men's chorus of the Opera in Nancy, a city that he loves because it's of its liveliness and hidden gardens. Since joining the opera , he has had the chance to work with some celebrities like Cecilia Bartoli and Rugerro Raimondi. 2 Q: What do you like best about your job at the opera? The least? A: What Mr. Lyndaker likes best about his job at the Opera is the beautiful music, live performance, and the direct contact of his voice with the public’s ear, which is not like in a recording. The opera creates an emotion, for example butterflies in his stomach and good stress. He doesn’t always like the proximity with the artists backstage though, and the relationship between the artists is not always good. 3 Q : Which opera did you like singing in the best ? A: Mr Lyndaker has sung in 80 different operas. His favourite is a 19th century one, composed by Tchaikovsky and his favourite piece is Lenski’s Aria. He told us a little about the story of it: “It’s a man who has to defend a woman he is in love with. In the duel he fights another man for the honor of his love. And he knows that in the end, he will die”. This song excites him because there is passion. He also says costumes help to show how you feel. But he does feel stressed before each show. 4 Q: How do you feel before a performance? A: Before a performance Mr.Lyndaker normally feels excited . However, singing a main role is stressful. And he tells us that sometimes singing just a phrase in a show is even more stressful. Costumes are important because the artists have to feel comfortable when they sing. A professional like Mr. Lyndaker, who has sung for a long time, doesn’t take much time to warm up. But all singers have to take care of their voices because even if they are sick the show must go on! 5 Q: What were your best and your worst experiences with a dresser? A: I don't think I had a worst experience with a dresser, it was always good, they were always calm and helpful, but the problem is with the dressing room, sometimes they are uncomfortable or too small. Q: How often do you need a dresser? A: ALWAYS! For example, even during for Mozart’s Requiem, I need help to put my tuxedo on. Q: Have you got any advice for us? A: Don't stop, try to pursue your career and team work is very important. Calm is the best feeling you can transmit to an artist before he goes on stage.